Although the holiday season is a busy time, I was able to take some time to relax and think back; I would like to share with you my retrospective. And then, I will give you a little hint of what I have planned for 2014. The time-consuming work on my website shows a slow, but steady, positive effect – more and more interested people are finding it. People still visit my exhibition, even though it has no regular opening hours. 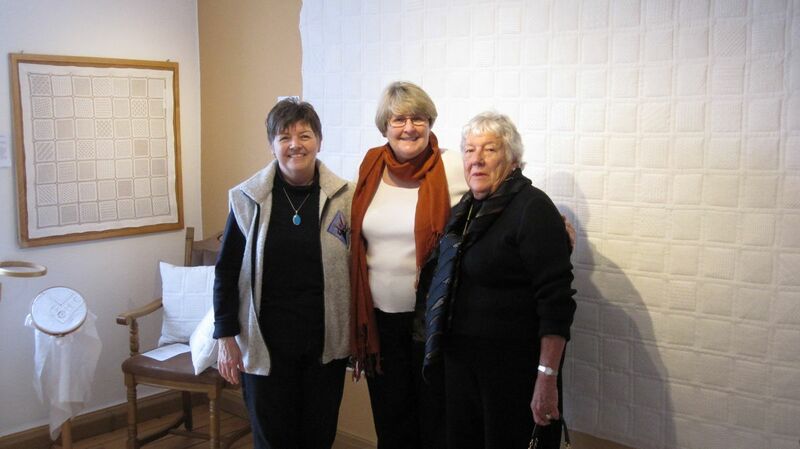 The ladies of an embroidery circle celebrated their 30-year jubilee with a visit. Other interested people wanted to look again – this time to examine details – after a quick visit some time ago. 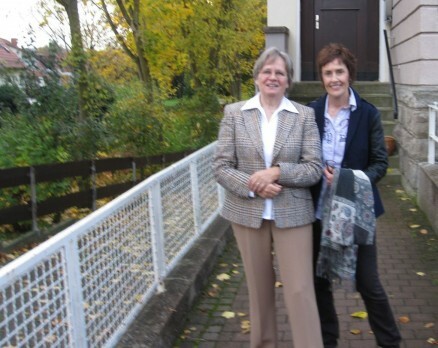 Also, I was privileged to welcome Kathy Andrews, an American currently living in Germany, who is interested in all kinds of European embroidery. She wrote about her experiences on her nice website, The Unbroken Thread. Many embroiderers from far away, but staying in the vicinity by chance, took the opportunity to see my exhibition. And some specifically travelled over hundreds of kilometers to view my embroidered collection. And I have welcomed some well-known persons of embroidery guilds. Two years ago, Barbara Kershaw, who teaches Schwalm and other whitework techniques through the Embroiderers’ Association of Canada (EAC) and the Embroiderers’ Guild of America (EGA) travelled from Canada to visit. And this year, a member of the Cape Embroiderers’ Guild (CEG) visited from South Africa as well as Deborah Love from Australia. She is the current president of the Embroiderers’ Guild of Queensland, Australia. 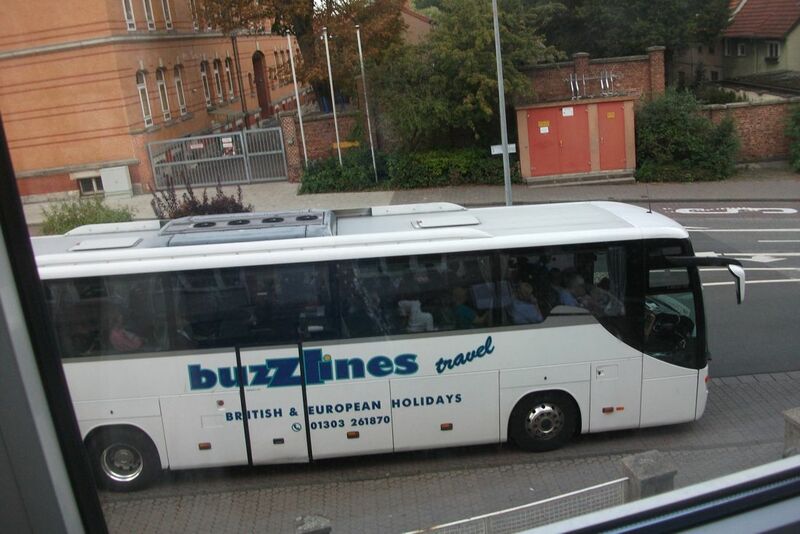 An absolute highlight was the visit of a large group of, mainly, British ladies. 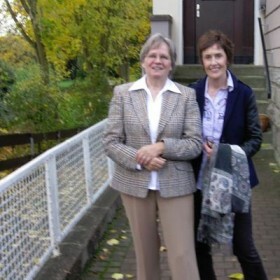 Mary Hickmott, the publisher of the magazine “New Stitches”, organized a holiday in Germany for readers of the magazine. I was honored that my exhibition was included, with other significant embroidery collections, in their itinerary. It was so thrilling, so exciting, and amusing that I totally forgot to take a photograph of the ladies. 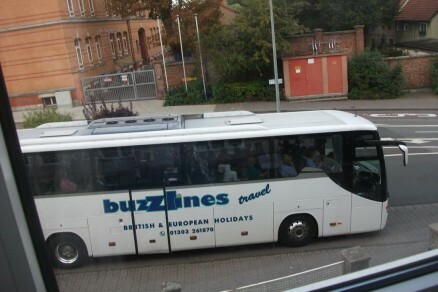 Only the bus carrying all the visitors was documented. I now understand myself to be a junction for embroiderers from the East and West, from the North and South. By chance, I helped two embroiderers to revive a friendship after they lost track of each other years ago. They lived relatively near to one another without knowing it! For others, I could help them find like-minded persons nearby. All this infuses me with pleasure, satisfaction and quietude, and so I enjoy my job! Over the entire year, I had very nice contacts with people all over the world. Over and over again, I am astonished to experience the simplicity of quick and uncomplicated understanding with people in the remotest places of the world. And I am constantly surprised to realize the number of people, on all continents of this earth, who are interested in Schwalm whitework. Unfortunately, one of my visions is not realizable because of technical problems. I have had to put on hold my plans to establish an internet museum for whitework. Traveling to faraway countries and staying in strange environments is not only expensive, but also very strenuous. So, I got the idea to establish an internet museum to visit any time, comfortably from a domestic chair. One could visit as often, and dwell as long, as one might want. Such a project is challenging for a small business such as mine, and the plans must be put aside for the time being. So, I look for a practical solution to enable you to view traditional and brilliant contemporary Schwalm whitework from home. I also have hopes, for Summer 2014, to put together a new and big exhibition with Schwalm whitework pieces. The preparations have already begun – I hope to see the project to fruition. Rest assured, you will hear from me about all of these! For now, I wish you all the best for the coming year; take much pleasure in Schwalm whitework and enjoy each and every stitch.